One of the things that most inspires me about schools in Reggio Emilia is the connectivity they have to the families and the communities they serve. Something I am striving for this year is a stronger link between home and school. Some of the questions I have been pondering are: How do I make my students and their parents feel welcome in our learning space? How do I develop a learning partnership with my students’ families? How can I tap into the rich knowledge, skills, and experiences each family possesses? 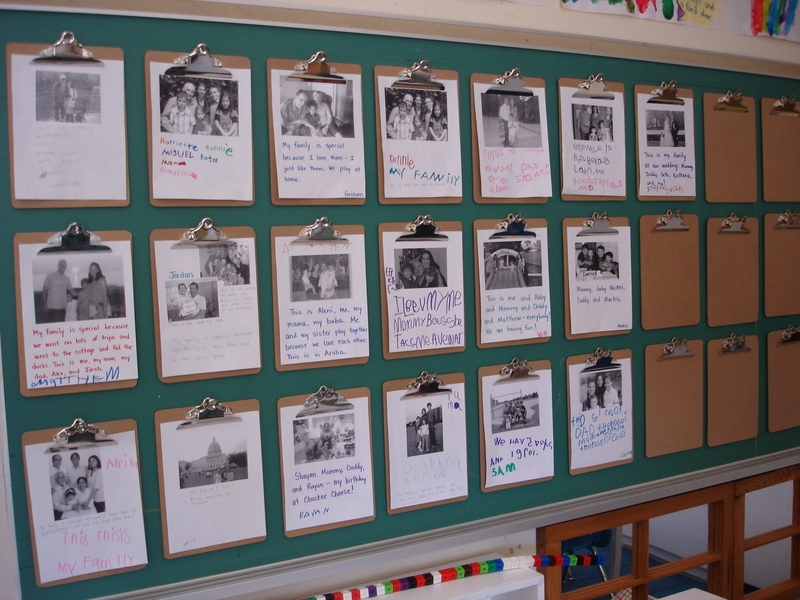 This is a picture of our classroom family wall – a dedicated spot in the room that holds photographs of the children and their families (and pictures of my family and our ECE’s family too!). As the photos have been brought in we have taken time each day during our sharing circle for the children to introduce and talk about their families. We’ve learned about brothers and sisters, moms and dads, grandmas, papas, opas, and bubbis (and even a few family pets!). Throughout our discussions, we’ve encouraged the children to think about what makes their families special. After sharing, I also photocopy each photo and use it for an interactive writing activity with each student which gets posted on our author’s wall. The children have been so excited to take turns sharing their families with us and can often be found gazing at the family photographs on our family wall during centre time. 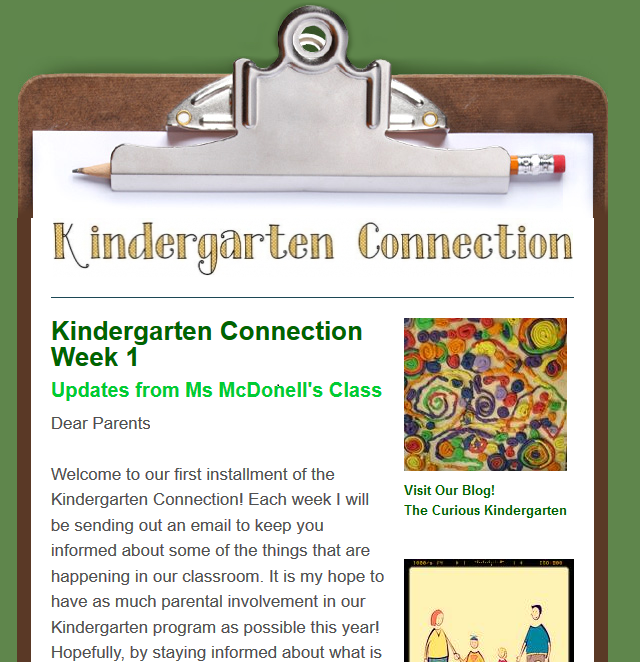 Another way I am trying to connect with parents this year is by sending out a weekly email which highlights some of the ideas/concepts/discussions that occurred in our class during the week. The email includes photographs which demonstrate the children’s thinking and learning. The hope is that some of the discussions we are having at school will be carried on at home. What are some ways you celebrate your students’ families and involve parents in your program? This entry was posted in Classroom Design, Parent Involvement and tagged classroom design, kindergarten writer's workshop, parent communication mail chimp, Reggio inspired kindergarten by msmcdonell. Bookmark the permalink. At my reggio-inspired school we send out a daily exploration every single day. its a lot of work but i love it. it includes pictures and summarizes the childrens dialogues during circle time. I love this so much! Do you have a letter that you send home to parents? Would you mind sharing it?